Effective communication with clients, families, and professional colleagues starts here! With Interpersonal Relationships: Professional Communication Skills for Nurses, 7th Edition, you’ll see how good communication skills can lead to achieving treatment goals in health care. Clear guidelines show how you can enhance the nurse-client relationship through proven communication strategies as well as principles drawn from nursing, psychology, and related theoretical frameworks. And you’ll see how to apply theory to real-life practice with case studies, interactive exercises, and evidence-based practice studies. A two-time winner of the AJN Book of the Year award, this book is updated to emphasize interdisciplinary communication and QSEN competencies. 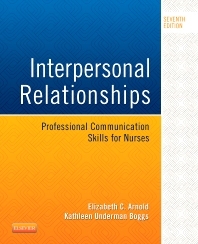 From expert nursing educators Elizabeth Arnold and Kathleen Underman Boggs, this comprehensive, market-leading text is unmatched for helping nurses develop effective communication skills! Interactive exercises offer the opportunity to practice, observe, and critically evaluate your professional communication skills in a safe learning environment. Practical guidelines describe how to modify communications strategies for various populations and situations including children, the elderly, end of life, clients with special needs, health teaching, stress, crisis, and professional colleagues. Case examples help you develop empathy for clients' perspectives and needs. Nursing, behavioral, developmental, family, and communication theories provide an essential foundation and a theoretical perspective for effective communication. Learning objectives, chapter overviews, and a detailed glossary focus your study and help you absorb and retain key content.